Australia‘s federal rules on police use of force generally comply with international standards although an amended law in New South Wales allows use of firearms against suspected terrorists even where no imminent threat is perceived. Australia's federal constitution does not protect fundamental human rights nor does it regulate the use of force by the police. There is not yet a regional human rights treaty to which Asian nations can adhere. The Australian Federal Police is the principal national law enforcement agency. There are also state police forces. Both federal and state police officers in Australia carry pistols, pepper spray, and batons. Many also have access to conducted energy weapons (e.g. Tasers). (1) A person must not, in the course of arresting another person for an offence, use more force, or subject the other person to greater indignity, than is necessary and reasonable to make the arrest or to prevent the escape of the other person after the arrest. (ii) the person has, if practicable, been called on to surrender and the constable believes on reasonable grounds that the person cannot be apprehended in any other manner.S. 3ZC, 1914 Crimes Act. Use of firearms is generally only lawful where necessary and where a threat to life or limb is imminent. In 2013, the Australian Institute of Criminology reported that in 1989–2011, police fatally shot 105 people, of whom more than 40% had been identified as having some form of mental illness, with psychotic disorders such as schizophrenia being the most common. In Victoria, firearms must not be drawn by a law enforcement official unless extreme danger is anticipated and firearms may only be discharged when he or she reasonably believes it is necessary to protect life or prevent serious injury. Warning shots should not be fired.Victoria Police Manual Instructions 101-3 6.3. (1) The police action that is authorised by this section when police officers respond to any incident that is declared to be a terrorist act to which this Part applies is authorising, directing or using force (including lethal force) that is reasonably necessary, in the circumstances as the police officer perceives them, to defend any persons threatened by the terrorist act or to prevent or terminate their unlawful deprivation of liberty. (2) A police officer does not incur any criminal liability for taking any such police action for the purposes of a police action plan of the police officer in charge of the police officers responding to the terrorist act. (3) This section applies only to action taken by a police officer in good faith.S. 24B, Terrorism (Police Powers and Parole) Act 2017.
that the close relationship between the police investigations and the coroners’ investigations may compromise the independence of the coroners’ investigations.Human Rights Committee, Concluding Observations on Australia's sixth periodic report, UN doc. CCPR/C/AUS/CO/6, 1 December 2017, §31. There are also oversight bodies in the various states. In Victoria, for example, alleged excessive use of police force is investigated by the state's Independent Broad-based Anti-Corruption Commission (IBAC). 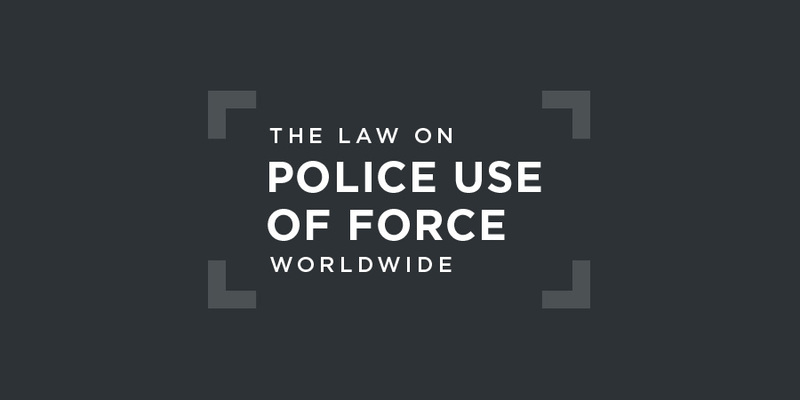 that all allegations of excessive use of force by the police, including deaths in custody, are investigated in a fully independent and impartial manner.Human Rights Committee, Concluding Observations on Australia's sixth periodic report, UN doc. CCPR/C/AUS/CO/6, 1 December 2017, §32. There is no regional human rights body to which alleged victims of excessive use of police force can complain. The High Court of Australia is the ultimate court of appeal on issues of both federal and state law. In its judgment in 2012 in this case,ACT Court of Appeal, Australian Capital Territory v. Crowley and Commonwealth of Australia and Glen Pitkethly  ACTCA 52.the ACT Court of Appeal overturned the finding at first instance that the Australian Federal Police (AFP) owed the plaintiff, Jonathan Crowley, a duty of care, and had breached that duty of care. This duty of care can be considered akin to the duty of precaution under international law. The case concerned a call-out on 11 December 2001 to the AFP, which had received reports that Mr Crowley was walking in the streets in a highly disturbed state and behaving in a threatening manner to a number of people while carrying a kendo stick. When two AFP officers approached him, he refused to comply with their instructions and struck both officers with the stick. One of the officers shot him in the neck, shattering his spinal column and leaving him a quadriplegic. He did not argue that the shooting was unreasonable. The Court of Appeal held that the AFP could not be under an obligation to discharge a duty of care when apprehending someone to prevent apparent or possible criminal behaviour. due to the nature and immediacy of an imminent lethal threat, it is essential that the police response is to incapacitate the threat. To achieve this police officers will shoot at the “armpit hold” – the centre of an imaginary transverse cross-sectional line between the two armpits of the human body (roughly centred on the heart/aorta and lungs).Coroners Court of Queensland, Recommendations from Inquest Into the Deaths of Anthony William Young et al (2017), §63. The person exercising the power of arrest is entitled to use such a degree of force as in the circumstances they reasonably believe to be necessary to effect their purpose, provided that the means adopted by them are such as a reasonable person placed as they were placed would not consider to be disproportionate “to the evil to be prevented.”Supreme Court of Victoria, Slaveski v. Victoria  VSC 441 at  per Kyrou J, citing R v. Turner  VR 30 at 36.